could You tell us what type of the miniPCIe SATA controller You use in this perk? I want make my own case for the NAS solution. Based on an ASM1061 chipset. It was said in the comments about 26 days ago. Thanks for response. I’m not sure if it’s just your nick or you are somehow connected to CZ.NIC but they should put this information in the perk or on the specification site of Omnia because nobody is watching comments nonstop and it’s not so easy to find it there after few days. or… Will there be possibility to buy stuff from NAS perk except box? Supports two SATA 3.0 6Gbps ports. Revision 2.0 backward compatible to Revision 1.0a. 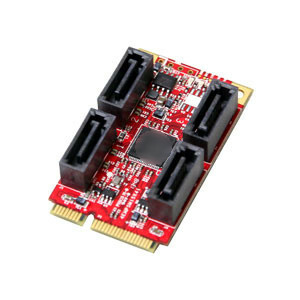 Compatible with PCI-E Mini Card Electromechanical specification revision 1.2 Serial ATA (SATA) Interface. Supports SATA 3.0 transfer rate up to 6Gbps. | eBay! Where can I find a suitable power cable for SATA hard disc, such as in this Turris Omnia: Installation of the router in the NAS box - Youtube video at 4:46? I want that cable, too. That’s why I also asked in linked video 2-3 weeks ago. Please, can anybody help me with this problem? I’ll suppose, I’ll make the cable by myself. The black connectors are commonly used in PCs. It isn’t complicated to put them down from power cable and put them on cable with the white connector. Or I’ll take the white one from a fan cable from PC (or power cable from other device) and put it on power supply cable from PC. It’s depend what going to be easily. I did some testing on my own to compare the speed of the mSATA vs. the SATA controller in the NAS perk. I tested the Samsung EVO 500MB mSATA against 2x HGST 4TB 7200RPM Deskstar NAS drives in a btrfs RAID 1 mirrorset. So, according to these tests, the mSATA interface is a little slower than I expected, but the mini-PCIe SATA controller in the NAS perk is faster than I expected. Either one can write faster than the Gigabit interface can transfer data. The “black connectors” you are talking about are not designed for such high currents of 2 HDDs. There is a reason for the special “white” connector. I think he talked about the black connectors on the power cable. These are SATA Power connectors and can sustain quite a bit of current. I think the white connector isn’t special. Just the combination of the connectors is unusually. I think You are wrong. I see, you are discussing there the internal power connector as well. I would like to ask if someone know what this connector is able to power. I did test with 4 HDD’s and its working just fine, but I would like to know the limits. Thanks. The voltage regulators for 12V, 5V and 3.3V are 12A but they are not the limit. The input is protected with a 5A fuse. The PSU has a limit of 12V, 3.33A so 40W. 3.3V is also used for on board devices including miniPCIe including LTE and mSATA. 5V is also used for the USB connectors. So four 3.5in harddisks is a bit hard for their power up current requirements and will probably cause problems. Four 2.5in devices should be possible if the USB ports are not connected to devices with high current consumption like 2.5in harddrives. TL;DR: you need to make one yourself (or have someone make it) but all the pinouts are documented so it’s not major problem (for someone who knows how to solder that is). Are you using it with four drives? Are you powering all of them from Omnia?